Baking With Betty - Baking Stations mean Baked Goods! ﻿On my last Baking with Betty post I left off at "Baking with Betty Orientation 101". (see pic below) . So let's take off from where we left off, shall we? After "orientation" we were given brief instructions and then free reign on the Betty Crocker Kitchens. OK, not total free reign as there were Betty Crocker Bakers assigned to each station, but the bloggers outnumbered the bakers almost 8 to 1 LOL. The test bakers who helped us were fabulous in reality. They were able to answer all of our questions, asked for our opinions and showed us tips and tricks. Once entering the kitchen I was astonished at the size of the kitchens (all of which were fully stocked). All kinds of food, baking accessories and cooking utensils. I am not sure who is in charge of the shopping but kudos to them - those kitchens were not lacking for ANYTHING. Later I discovered that not only were there the 3 dual kitchens observable from the overlook, but an additional 7 - 8 test kitchens on an adjoining wing! Upon entering the kitchens, we were shown the 4 stations - Brownies, Breakfast, Cookies and Cake. We were broken into 4 groups and assigned to one of the stations to start off with. At the end of the day left with a book containing all of the recipes of our creations. I am sharing the recipes here with you! The picture below is the actual batch of the Brownies on a Stick I decorated; above is a picture of me actually doing the decorating (I am the one in the middle). There were fairly easy - use a square baking pan when baking brownies. Cook brownies and let cool. Slice into 15 rectangle slices using 3 rows of 5. Slightly freeze brownies to give a solid foundation to work with. (Do not totally freeze). Insert Popsicle sticks into brownies. Once complete, dip brownies into melted chocolate and then your choice of toppings. Below are 2 pictures of me and the girls making the same brownies upon my return home! At the Betty Crocker Kitchens we used sprinkles primarily. At home we used sprinkles, nuts, and coconut for more variety. Back to the Brownie Station....Also at the same station were the Brownie and Berry Dessert Pizza. - here is a picture ..... 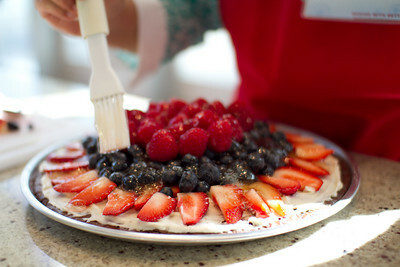 I helped slice the berries and one of the other ladies in the group pretty much did the rest. On the left is the ones the professionals created before we came and on the right is our replication - Gorgeous! The next station was Breakfast - there 1/2 the group and I helped make a breakfast Caprese Pizza with Crispy Pancetta - bisquick, fresh t﻿omatoes, fresh basil and fresh mozzarella were key ingredients - Here I am assembling! I loved using the fresh ingredients and it was so simple! The other half of our group made Fresh Lemon Creme Crepes. I did not have time to make both and the pizza is also actually more of something I would actually do at home so no regrets here! 2 more recipes that were available for sampling were the Cherry Swirl Coffee Cake and Apple Oven Pancakes. At the Cookie station we were made a couple of nice batches of cookies Citrus-Kissed Fig Thumbprints. My major contributions at this station were the simple tasks of zesting a lemon and keeping track of the timers. Although we had fun making the cookies, there were also different versions to sample. My favorite was a Cranberry Macadamia Bars - a winner from one of the prior baking contests. I am not sure of who the creator is but OMG, these were to die for!!!!! These will be making an appearance in my own kitchen!. Many of the other ladies LOVED the Creme Brulee Cheesecake bars. (These were yummy also, but my favorite is still the Cranberry Macadamia Nut Bars) Other cookies that I did not get to try but looked delish were the Red Velvet Rich and Creamy Cookies, and the Citrus-Kissed Fig Thumbprints that I helped bake. The final station was Cakes It was much, much simpler﻿ than it looked. You can see the Mini Pumpkin Cakes and Jack-o'-Lantern Cake shown in pictures below - perfect for October! There were also the CUTEST Ice Cream Cone Cakes, which I also plan to make with the girls. I helped with the Jack-o-Lantern Cake and could not believe how easy it was! At the end of the day we had fun but left hungry - no time to eat! Just kidding :) Quite the opposite. Most of us overindulged just a bit. The food was fabulous - between breakfast, lunch and baked goods, we had it all! The fine people at General Mills made sure that we were well fed! On my next post I will fill you in on the details for all of the great products we were introduced to. I bake some things from scratch (pumpkin bread, pudding), but I also consistently use boxed mixes for others (cake) or if I want to save time (brownies and cookies). Some of the products we shown look wonderful! My favorite is a dessert mix that can be used as a base in numerous baked goods. From unique to fun to elegant Betty Crocker has a recipe for you. 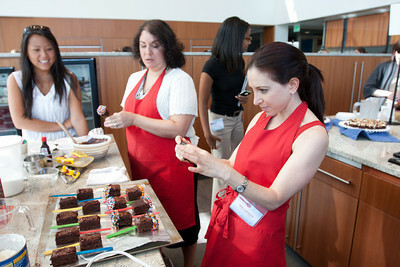 These professionals working in the test kitchens dedicate their time to creating new and fun items for the home cook. Some of the recipes are the result of home cooks who just have a knack for baking. You do not need to go to the Betty Crocker Kitchens to learn to make these - ALL of these recipes can easily be made at home. One thing I learned there is don't be afraid to try new things. Great recipes are the result of someone who is willing to try be creative by thinking outside the box and trying the "untried". If you are considering something different for your next gathering, something fun to do with the kids or a fun way to pass the time, and don't want to experiment on your own, visit BettyCrocker.com. There you will find a multitude of great ideas, tried and true, to give you a great baking experience at home! General Mills covered the costs of my trip to the Betty Crocker Kitchens. I was not required to right a post. All opinions expressed are my own. For more information on this blog and on my posting practices, please refer to the disclosure policy at the bottom of the page. Hi everyone - thank you to those who sent kind words following the death of my father in law. It was such a shock and still has not really registered yet that he is gone. He was such a great person and will be missed by so many. I am still getting caught up at home, at work and with blogging since returning. (I would like to thank my sponsors and partners for their kindness in understanding the circumstances behind my the late reviews this month). Our review of 2 Nancy Drew games; a review and giveaway for "Eating Animals", a wii game review and a necklace review. Please stay tuned for my upcoming CSN giveaway!! Oh, and also more "Baking with Betty" details - this time on the fun stuff like info on what we baked! In case you were wondering..... I plan to get in touch with emom rewards to draw a winner for the nursery set! We have exchanged emails but plan to talk soon. I am having the sponsor select the winner via random.org and then verify the eligibility before contacting the winner and posting. Hopefully early next week. Again, thank you. for all of the above come back very soon! Clutter seems to be attracted to children's bedrooms like a moth to a flame. If you are like most moms, the constant cleaning, picking up, straightening and organizing can begin to wear you down. Instead of spending your days and nights constantly cleaning your child's room, try some of the quick and easy tricks below. Before you start putting things away, start by getting rid of all the broken toys and games and puzzles that are missing pieces. Sort through the dresser drawers and pull out the clothing that no longer fits your child or is out of season. By getting rid of the things that do not belong in the room, you can easily organize the things that do. If your child is attached to everything he owns, or thinks he cannot throw anything away, it may be best to do this step when he is not around. Once you have cleared out the bedroom of things that no longer belong, start sorting what remains. Do not be afraid to make piles around the room until the sorting is over, as this makes it easier to see where everything is and what type of container will be best for storing it. If you have the time, clear out dresser drawers, the closet, under the bed and everywhere else toys and clothes might be hiding. It is a big job to organize a child's room, but if you can get it done all at once, the odds of it staying organized longer are better. You have purged, you have sorted and now it is time to put everything away. If you have access to a dresser and closet, begin by putting clothes away first. Certain things will need to be in an easily accessible spot. For instance, if you want your first grader to pick out her own tights to match her school uniform, place the tights in a drawer that she can reach without having to stand on a chair. By making it easier for her to get to her things, she is more likely to keep them organized. The same holds true with shoes and toys. Put them in a place your child can easily reach. Clear bins and baskets are often the best storage containers for toys and books, as children can see what is in each container before pulling it off the shelf. While putting things neatly away may seem like the logical final step, the last step is to actually label everything. Label which toys are in each bin, even if the bin is clear. If the toy trains and toy cars are both dumped out on the floor, you want to make it easy for your child to put them back in the right bins. Label with pictures made out of construction paper and add a label that says "cars" as well. Do the same for each bin and basket, labeling with a picture and word for young children, or just a word label for older children. By making things easy to find and easy to put away, you create an environment that your child can successfully take care of. It may take reminders and reinforcement to get your son or daughter to constantly pick up their toys and clothes, but once they get into the routine it will be easy for them to continue. Spend a Saturday purging, sorting, containing and labeling and you may find that your cleaning chores during the rest of the week are cut in half. We arrived at the General Mills Campus around 8:00am the morning of the 24th of August. Hard to believe that was almost a month ago. When we arrived at the facility, the other bloggers and I signed in and left our luggage up front. We waited for a few anxious moments until we were finally gathered to head on in. Then the fun began! The company I work for also has a beautiful building - it is a state of art 10+ story building that is decorated in a clean, retro-modern style with fresh colors and trendy furnishings. It has a very European feel and is actually considered a "green"building (even our signage is green!) The General Mills Campus is just as beautiful and modern, but different - where my company is service related, General Mills has consumer products, most of which are household names. I loved the collaborative nature of the work environment. While walking around, it was not unusual to observe people working in common areas with their laptops, outside the confinements of a cubicle or office. The environment was energetic and fun - what a great way to boost creativity! After viewing the kitchens from above and afar, we were next brought down and seated in a room next to the test kitchens. While we ate an absolutely delicious breakfast (of course! ), learned about the day's agenda, covered relevant materials including a brief history of the company, specifically the Betty Crocker brand. It was really interesting to hear about the various Betty Crocker icons throughout the years. One thing the historian jokingly but honestly noted was that through the years Betty has gotten younger AND better looking LOL. From the humble beginnings of helping homemakers via radio and in a "Dear Abby" style during the depression era to being a current household name in modern times, Betty Crocker has been in American Households for nearly a century! click HERE for more details. Soon after we were given aprons and given prep talk on what to expect! Watch out! 30 blogger ladies were ready to storm the Betty Crocker test kitchens.... that is where the real fun begins. My next posts will cover the baking sessions, recipes, new products and a tour of the studios (film and tv). Stay tuned for all the gooey details on the brownie, cookies, cake stations. (And not to be forgotten, breakfast). One habit that many people would like to develop is packing their lunch every morning, as well as lunch for the rest of their family. There are many advantages to home-packed lunches, such as having total control over the healthiness of the foods that go into the lunchboxes, as well saving quite a bit of money as compared to buying lunch every day. However, it can sometimes be difficult to get into the daily habit of packing lunches, and even more difficult to think up easy and yet interesting lunches that you and your family will enjoy. Let everybody in the family choose a new lunch box to kick-start your effort, which can help get the family excited. When shopping for lunch boxes, make sure that they are sturdy enough to be able to withstand being carried to work or school every day, and are large enough to pack an adequate lunch. They should be insulated and have cold packs available, so that you can pack foods that need to be kept cold without worrying that they will spoil before lunchtime. Children who are used to eating school lunches, as well as spouses who are used to eating out at restaurants for lunch might be a little reluctant to replace their usual routine with a home-packed lunch. Involving everybody in the process of choosing lunch foods is a good idea, helping to insure that everybody gets a few of their favorites every day. Make a list of everybody's favorites to refer to when you need inspiration for what to pack in everybody's lunch box. One obstacle to lunch packing is the time it can take. There's always the temptation to just give the children lunch money when you are rushed for time. To help insure that lunches get packed on schedule, set some time aside each evening to prepare. You can package up many of the lunch items in advance, such as cutting up vegetables and placing them in individual sandwich bags, or even preparing sandwiches in advance if they are not made from ingredients that could make the bread get soggy overnight. You can also pre-chill drink boxes in the freezer overnight, which will help keep lunches cold the next day, while thawing in time for lunch. Another easy trick for speeding up the lunch packing process is to just automatically divide foods up into individual portions as soon as you buy them from the store. This method is much less expensive than buying foods already packed in individual servings, while still providing you with a handy supply of individually bagged lunch foods, ready to pop into the lunch boxes in the morning. Just because a lunch is packed at home doesn't necessarily mean it is healthy. Become an expert in finding good and nutritious foods for your family. When selecting beverages, individual juice boxes that contain 100 percent juice are often the best choice. Small cartons of milk are also good as long as you include an ice pack. Children love finger foods, so bags of cut up vegetables, grapes, or cherry tomatoes are excellent choices for lunches. If your spouse loves salad, make clean-up easy by putting the salad greens in one sealable sandwich bag, and the dressing in another. Then all they need to do to pour the dressing into the salad bag, shake, eat, and throw everything away when finished. Don’t forget to include a fork. Did you know that early in the history of English, the words "grammar" and "glamour" meant the same thing? Definition: the power to charm. If you didn't, don't feel bad because I am sure very few people DO know this. In the Glamour of Grammar, author Roy Clark describes the correlation between the two. What Strunk did for writing structure in The Elements for Style, Roy Peter Clark, is doing in The Glamour of Grammar. 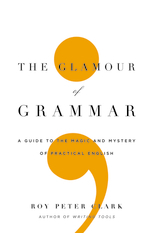 I am not the first writer to notice this - in looking over reviews on other blogs, or publications, the common consensus is that The Glamour of Grammar is a more modern guide to writing effectively compared to classic books on this subject. Just like The Elements of Style, The Glamour of Grammar is destined to be the required text in many English classrooms. - The importance of using proper language when writing. - Tell your story. Make it interesting. Make it descriptive. Make it fun! I look forward to referring to this book often. This would be a great gift for the aspiring writer or anyone just interesting in perfecting their writing skills. Also, with so many kids using "text talk" this would a godsend to helping understand the intricacies of the English language. For your chance to win a copy, simply make sure that you are a follower and share what writing techniques you use or why you would want to win this book. There will be 3 winners. 1 extra entry for following in twitter @misaacmom and tweeting. Please submit a separate comment for each entry. - You must be a follower in order to win! - Winner will be contacted by email and respond within 48 hours from notification or another winner will be selected. This post was written for Hachette Book Group who provided the complimentary product for review and giveaway in exchange for my honest opinions. For more information on this blog and my posting practices, please refer to the disclosure policy below. It is back to school time! What does that mean? Sports, afterschool activities and brown bag lunches, Hellmann's® and Best Foods® Mayonnaise are putting the fun back into lunch this September with their virtual Sandwich Swap 'n' Share program. Chef Bobby Flay and actress Lori Loughlin are teaming up with Hellmann's® to help re-launch Hellmann's® virtual Sandwich Swap 'n' Share on the Facebook® application. This is a virtual version of the age-old tradition of swapping lunch items. By participating in the online version, swapping your virutal sandwiches will benefit Share Our Strength®, a non-profit organization dedicated ending childhood hunger in America. When you visit the Hellmann's® Page on Facebook®, you will have the opportunity to create a sandwich on the application; , for every sandwich built, Hellmann's® will make a donation to Share Our Strength® (up to $75,000). For every five sandwiches built or sent to a friend between 9/9/10 and 12/31/10, Hellmann's will donate $1 to Share Our Strength, up to a guaranteed maximum of $75,000. And speaking of sharing, you know we rely on you to help us spread the word about these great programs to your friends and readers! By posting about the Hellmann's® virtual Sandwich Swap 'n' Share on your blog, you'll be eligible to win a $250 grocery store gift certificate and a 6-months supply of Hellmann's®/ Best Foods® mayonnaise. Now that's a lot of yummy lunches! Basically you create a sandwich, let Hellmann's choose one for you OR pick a celebrity version - then trade with your facebook friends and family! So far $340 has been donated so get creative and get trading! I did not receive any form of compensation for this post. To thank be for posting, my name has been entered into a drawing to win a gift as part of the Hellmann's® program and in partnership with BSM Media. Ziploc at home, work and back to school! My girls used to get school lunches exclusively, but lately the trend has been to bring their lunch. I may help a little but for the most part the girls select their meal items and pack their lunches themselves. I usually "audit" to make sure some healthy options are included but for the most part they are independently making their own! Ziploc plays a big part in our school lunches and snack routine. The girls find it easy to use and the smaller sandwich bags are the perfect size for snacks. We also use Ziploc bags for box-tops (in fact box tops are ON Ziploc boxes as well), money, and small items brought back from field trips such as rocks, shells, etc.. I have used Ziploc for years. I usually don't use the slider bags but I have gotten used to using them and have to say I really like the simplicity and ease. Plus I don't have to worry about the bag not being sealed properly. For leftovers I use Ziploc containers to store leftovers. I used to microwave at home as well, but now I simply use for storage and opt to microwave in glass or ceramic containers. I much prefer the Ziploc for storage however - the seal is air tight and it prevents premature spoilage. Lately I have gotten into the habit of reusing Ziploc bags; I simply turn the bag inside out, wash thoroughly and let air dry - the quality of the Ziploc bags (vs. generics) provides the durability to withstand multiple washings. For you greenies, Ziploc has teamed up with Terracycle! If you want to even go more green, Ziploc now has a line of eco-friendly products named Evolve. Right now you can dowload a free Fall Meals Recipe Guide at Ziploc with 2 UPC codes - click HERE! Also on the website is a VERY helpful Food Storage Guide - make sure that you bookmark this page! Ziploc is a great way to address your food storage needs at home, at work and at school. Feel free to share your tips and tricks by commenting below. This post was written for Family Review Network and SC Johnson who provided the complimentary product for review and giveaway in exchange for my honest opinions. I have made efforts to buying healthier grocery products for my family. More fresh fruits and veggies, and more organic. We are not on an organic diet by any means but I am trying to incorporate organic foods into our diets as much as possible. Organic Fruit Spreads – just launched in four flavors: Strawberry, Apricot, Seedless Red Raspberry and Blackberry Pomegranate; fruit is the first ingredient in each jar for a rich, home-style texture. Organic Fruit Sauces – new flavors are Apple Peach and Apple Tropical; 4-ounce cups are ideal with 100 percent daily vitamin C.
Organic Peanut Butter – This is not a new product in the Santa Cruz line, but is of course the perfect complement to the new fruit spreads. My girls are definitely Peanut Butter and Jelly people! I don't have a picture of the Santa Cruz Organic Fruit Cups because they were gone within a day. I tried one (delicious!) and my kids apparently finished off the rest. I also tried the Santa Cruz Organic Fruit Spread (strawberry) with crackers - very sweet but not overly sugary. We already have 2 jars of peanut butter opened, one natural and one regular store brand. I have not yet tried the Santa Cruz Organic Peanut Butter but am very tempted to open the jar. The texture looks very creamy with natural color. The light roasted creamy "blonde" peanut butter looks divine! * I have just started purchasing natural peanut butter and my family is still trying to get used to it compared to the store brand types. Natural peanut butter has a thinner consistency and you have to mix it before using because the peanut oil rises to the top while the denser parts of the peanut butter "settle". I like the thought of not having a bunch of additives to keep the oil from separating. I look forward to incorporating even more natural and organic foods to our diets. If you are interested in trying Santa Cruz foods, use the store finder on the main page. I found that I can purchase these products locally at Wellspring Grocery! Please feel free to share your thoughts or experiences with Organic food, and particularly if you have tried Santa Cruz. This post was written for Family Review Network and Santa Cruz Organic who provided the complimentary product for review in exchange for my honest opinions. I don't mind doing laundry - My husband hates it but I really prefer it to many of the other chores that always seem to need to get done. Part of doing the laundry is to make sure I am doing my best to care for the clothing, bedding, bath items, etc. Regardless of loving it or hating it, the laundry needs to get done! Electrolux knows what a big part laundry plays in all of our lives. In addition to designing state of the art products to work more efficiently and make our lives easier, Electrolux has incorporated garment care into charitable efforts! September is Ovarian Cancer Awareness Month. What does that have to do with fashion? For all of September, Electrolux is donating $200 to OCRF for every new Turquoise Sky Perfect Steam™ washer/dryer pair purchased. Additionally, every day you press the Perfect Steam™ button online at Kelly-Confidential.com you take your clothing garments from rumpled to runway-ready and Electrolux will donate $1 to OCRF. Total, Electrolux has committed to donate $750,000 to this worthy cause. Also, you will be entered for a chance to win a shopping spree between $50 and $250 or the grand prize of a luxury washer and dryer from Electrolux! Electrolux, Perfect Steam™ and you can take any garments from "Rumpled to Runway". Find out how you can help support the cause at Kelly Confidential at www.kelly-confidential.com or at Facebook/KellyConfidential! When you participate, Electrolux will donate $1 to the Ovarian Cancer Research Fund. I did not receive any form of compensation for this blogpost. To thank me for my time, I have been entered for a chance to win the gift as part of the Electrolux program and in partnership with BSMMedia. For more information on this blog and my posting practices, please refer to the disclosure policy below. I will be working with the sponsor to draw the name of the very lucky winner of the emom rewards giveway ( must be a verified member to win per the rules). Stay tuned!